Plaster mold section for positioning fingers. 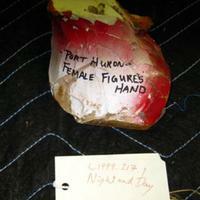 Written on the mold is "Port Huron female figure hand". There is a lot of red paint on the plaster.